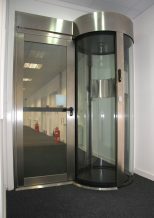 PRODUCT: C5 Cylindrical Security Portal SECTOR: Data Centres CLIENT: London Data Exchange LOCATION: London London Data Exchange wanted to provide a high class, secure facility to make headway into an established Data Centre marketplace. Physical security has become one of the top priorities for any data centre provider and is an area where data centres can differentiate themselves from the competition. It is London Data Exchange’s role to keep their clients equipment protected and online. They needed a system that offered cost effectiveness whilst maintaining a high quality, aesthetically pleasing look, prevented tailgating and was compatible with third party access control features. They also wanted to work with a proactive and knowledgeable team to assist in the installation and configuration of the system. After an extensive search London Data Exchange selected the Meesons C5 Security portal. 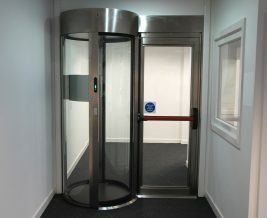 This portal is unique as it also incorporates an emergency exit door providing the flexibility to allow DDA access or movement of equipment. 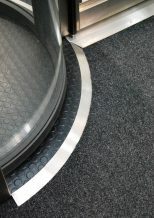 It also aids in the evacuation of a building should an incident occur, whilst still maintaining a high level of security and preventing tailgating. London Data Exchange were impressed by the system’s quality and the knowledge of the Meesons team, ensuring the correct product was selected to meet their needs perfectly. London Data Exchange are delighted with the results of the portal. Their customers feel their equipment is protected and their staff feel safe even when working alone in the building. The Director of London Data Exchange stated: "The portal is a perfect fit for us as it stops tailgating, is easy to use and operate and is high in quality. It ensures that procedures are enforced to the letter as no client can gain access without a valid ID card and by passing the biometric checks, which are done when the visitor is actually inside the portal. There is also an additional scan completed by the portal to determine if the visitor is alone. The secure side does not open until the bio is checked and it is confirmed that they are alone". 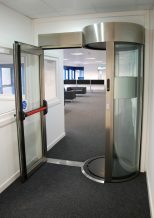 “Once through the portal every area of the building is classed as a secure area and so with it in place we know that everyone in the secure area has the right to be in there. Those without correct access rights are kept out. The support and advice we received from Meesons throughout the initial consultation and installation were exemplary”.